Philips has released an expansive new 49-inch 32:9 SuperWide curved monitor first seen at IFA, last September. 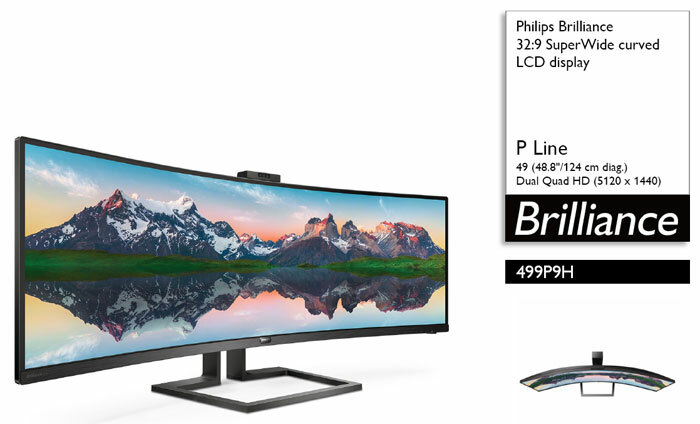 Dubbed the Brilliance 499P9H, this new monitor is said to be equal to a pair of 27-inch QHD monitors connected seamlessly together in an elegant curve. Among its other attractions are convenient USB-C docking, a pop-up webcam, Multi-View functions, and a curved VA panel with VESA-certified HDR 400 technology. Getting to the heart of the matter, the screen, Philips uses a VA LED display here, with Dual Quad HD (5120 x 1440) resolution, and a curvature of 1800R. It promises "dazzling colours, inky shadows, and sparkling whites," which Philips thinks will appeal to CAD and graphic designers, architects, engineers, photographers who require colour accuracy. Low Blue Light and Flicker Free modes are present for ergonomic considerations. Picking through the specs you will notice that this monitor has Adaptive Sync technology but only a limited range in which to apply it; 48-70Hz. Other interesting display functionality comes via the integrated multiclient KVM switch. With this switch you can control two separate PCs using a single monitor-keyboard-mouse setup. Multiview lets you split the screen for complex multitasking between your PC and laptop, for example. More flexibility is opened up by the built-in USB 3.1 Type-C docking station. This can be used for power delivery, and connection all your peripherals such as keyboard, mouse and your RJ-45 Ethernet cable – great for portable PC users. Philips has integrated a webcam into this monitor, which in itself is a premium move. However, it has gone further to make it a pop-up design, which guarantees privacy when popped-down. Last but not least, the webcam is equipped with sensors required for Windows Hello facial recognition, logging you in securely in <2s. Philips supplies a stand that is is height-adjustable (130mm), with swivel and tilt functions, and it is detachable so you can use any VESA mount. In an email to HEXUS, Philips said that the new Brilliance 499P9H is available now, and it has an RRP of £989. Thought it would have higher price, but with VA and 70hz seems appropriate. could you plug the USB-C cable into the USB-C port on RTX series graphic cards? this certainly has its need, I can think of a few industries where they could make good use of this in their control rooms. So are we heading for 180° wraparound? I want loads in a giant circle around me and a spinny chair.